Science is a core subject at Junior Cycle. At Senior Cycle we offer Agricultural Science, Biology, Chemistry and Physics. Science is also taught as part of the Leaving Cert Applied Programme offered by the school. Various science related modules are designed specifically for Transition Year students. We have a total of 5 Science laboratories which are very well equipped for teaching and learning as well as a Demonstration room. The new specifications for Science at Junior Cycle were introduced in 2016/17 and current 1stand 2nd year students are studying this new course. Students complete two Classroom Based Assessments (CBA’s) as part of their study. The first of these is in 2nd year, around April, and the second CBA takes place in 3rd year. There is also a sit-down exam at the end of 3rd year which is externally marked. 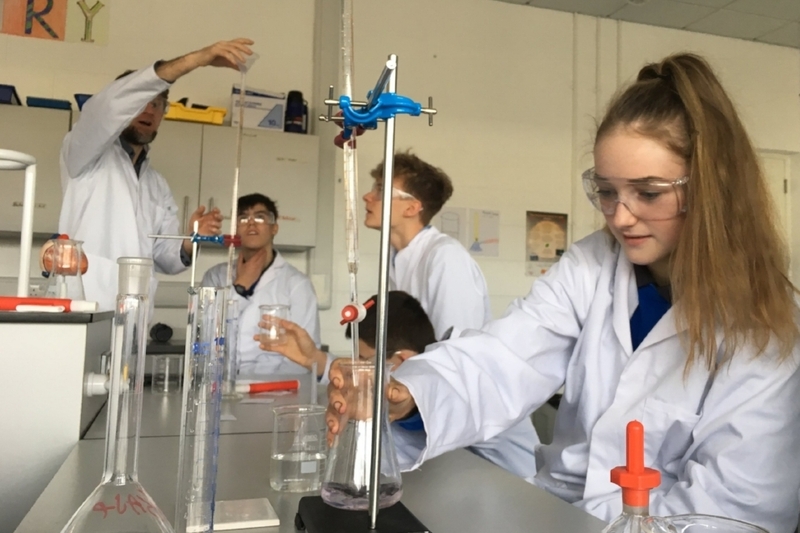 Extra-curricular Science activities include BT Young Scientist, Junior Science Quiz (Eli Lilly), Senior Chemistry Quiz (Pfizer) and a visit to Eli Lilly for 1styears during Science Week. The school is very proud of its distinguished record in the BT Young Scientist Competition, having won the competition 3 times. Kinsale Community School has a proud tradition of participation in the BT Young Scientist Exhibition with plenty of success over the years. We entered our first project in Year and have grown from strength to strength since then. This year we had a total of 19 projects accepted, with 39 students travelling to the RDS to exhibit their projects over four days in January. BT received over 2000 project applications and with space for 550 projects to be accepted it makes out total of 19 a fantastic success. The roll of honour is impressive, having won the overall award three times, in 2006, 2009 and 2013, as well as winning the ‘best school’ award in 2015. Many category awards and highly commended are received each year, adding to the sense of achievement the students already feel by making it this far. For students or incoming first years hoping to take part, you can enter as an individual or a group of up to three members. The process can begin over the summer as you come up with project ideas. Once we have returned to school in September there are roughly four weeks until the application deadline. A one-page proposal needs to be written, as well as any research and initial surveys or experiments. We meet regularly at lunchtime to guide the students through the process. We then have a break until the end of October, until BT inform us of the successful applications. This is where the work really begins for the lucky participants. Over the next two months they will work on their project, putting the final touches in place to be on the bus to Dublin on the first Wednesday we return to school in January. This time is filled with excitement and fun, checking into the hotel for three nights and proudly displaying their project for four days in the RDS. Impressing the judges, making new friends, the excitement of the opening and awards ceremonies, and ice skating are all part of an unforgettable experience.